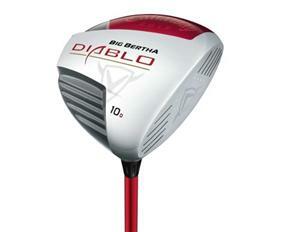 You're looking at the Big Bertha Diablo. I know very little Spanish, but I'm pretty sure "Diablo" means "Devil." Now why would a club maker name their new driver "the devil?" I usually reserve this terminology for clubs I just chucked into the woods. Perhaps it's because the clubface is so hot! This driver is built for speed and distance. The head is made of titanium comprised of a very light body, a super hot clubface, and a thin crown. For you golf nerds keeping score, the crown is 0.027 inches -- Callaway's thinnest ever. Making the frame so light allows for some extra weight. A weight chip is placed in the rear for a higher MOI and a lower center of gravity. What's more is, Callaway makes this driver in two different designs: a neutral and a draw version. The head shape steers the center of gravity into neutral or draw, and the weight chips varies from a 10 gram chip in the neutral version and a 15 gram chip in the draw version. Both models have a higher MOI than The Big Bertha 460. The neutral is 20 percent higher and the draw is 10 percent higher. I would recommend this driver to all levels. Previously, Big Bertha drivers were designed for high handicappers looking for a lot of help with their game. This is not the case with the Diablo. With the dynamic body shape, its performance will be appreciated by a wide range of golfers. For you big swingers who have trouble closing the clubface, check out the draw version.